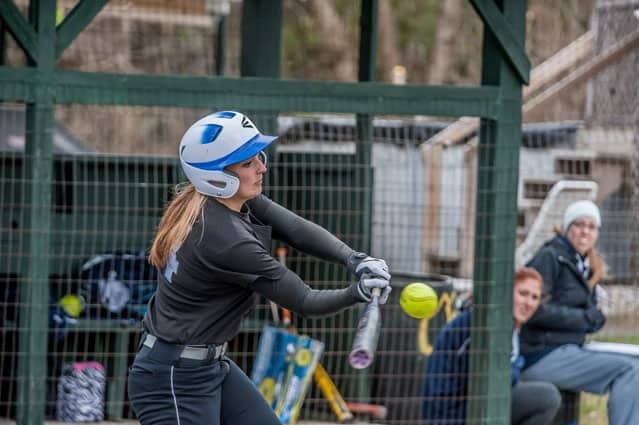 CSJ student Allison Hinton strikes a softball at a recent game. The Fighting Saints men’s baseball team played five games this week, which included winning the Yankee Small College Conference championship. The Saints will also be heading to Hampton, Va., as the No. 6 seed in the USCAA national tournament. The Lady Saints also played in four games of their own, which ended with them losing the championship game to New Hampshire Technical Institute (NHTI). The Fighting Saints baseball team matched up against Rensselaer Polytechnic Institute (RPI) and lost 2-1 in a close extra inning game. RPI walked off in the bottom of the 10th inning on a close forced play at the plate that was ruled safe. Tyler Kunzmann pitched eight innings in the game for the Saints with two hits and an RBI at the plate. The Lady Saints finished out their regular season with games against Lyndon State college. The Saints split the games winning 12-8 but also losing 16-9. In their win the Saints’ offense exploded early for eight runs in the second inning, and added runs in the 5th, 6th, and 7th inning to go on to win 12-8. Krysta Konderwich had a perfect day at the play going 4-4 with a walk, 3 runs scored, and one RBI. The Fighting Saints matched up against NCAA Division II opponent Saint Rose.The Saints lost 8-7 in a tough walk off win for Saint Rose. In the second game the Saints’ offense could not keep up with the offense of Saint Rose and lost 11-1. The Fighting Saints baseball and softball teams both had their Yankee Small College Conference tournament, held at Southern Maine CC. The Fighting Saints baseball team won their championship after defeating Central Maine 10-0 and taking down NHTI by a score of 3-0. Nestor Velazquez won best offensive player and Bill Brancatella won tournament MVP. The Lady Saints lost in the championship game to NHTI by a score of 1-0 after beating Southern Maine 6-0.